Arthur W. Pink has become known as a masterful expositor of the Word of God. Both his expository works and some of his doctrinal works have long been in print. His deep concern for experimental Christianity and the practical Christian life, however, is not so well known. Yet he wrote many short series and single articles on what Scripture has to say about the inner man. And in writing these articles Pink expounded the Scriptures as penetratingly as he did in his expository and doctrinal writings. His practical Christianity, then, is not a collection of pious thoughts on the Christian life or a simple outline of Scripture, but a full treatment of the subject. We may add that Pink’s concern for practical Christianity grew over the years. His earlier series concentrated on expositions and basic doctrines—expositions of Genesis, Exodus, the Life and Times of Joshua, the Life of David, the Life of Elijah, and of Elisha, the Sermon on the Mount, the Gospel of John, Hebrews, John’s First Epistle; and doctrinal studies: The Satisfaction (Atonement) of Christ, The Divine Covenants, Union and Communion, The Holy Spirit, The Inspiration and Interpretation of Scripture, and others. Pink was strong on exposition and doctrine; but, of course, these are a foundation for practice. Pink put it this way, in his introduction to The Doctrine of Mortification (in this volume): "It is the studied judgment of this writer, and he is by no means alone therein, that doctrinal preaching is the most pressing need of the churches today." "Doctrinal preaching is designed to enlighten the understanding, to instruct the mind, to inform the judgment. It is that which supplies motives to gratitude and furnishes incentives to good works." "Doctrinal Christianity is both the ground and the motive of practical Christianity, for it is principle and not emotion or impulse which is the dynamic of the spiritual life." But doctrine, unless reduced to practice, is of no avail. Pink wrote, "There is no doctrine revealed in Scripture for a merely speculative knowledge, but all is to exert a powerful influence upon conduct. God’s design in all that He has revealed to us is to the purifying of our affections and the transforming of our characters." To that end, this book is a collection of various articles and series in which the author wrote on the application of doctrine to the individual soul. This is practical Christianity. For thirty years Pink put Out a monthly publication, Studies in the Scriptures, mainly from his own pen. It is from this that most of his published works were taken. He would write an article each month on a given topic, continuing until he had exhausted the meaning of that particular topic. Several such series were kept going at once, in addition to individual articles and study notes. The chapters in this book are taken from the later volumes (Vols. 25-32) of Studies in the Scriptures. They vary in length from a single article in the original to as many as ten to twelve articles in a series. All have been selected because of their subject matter, and have been arranged approximately in order by theme. The first chapters (chap. 1-3) relate to the Christian’s beginnings in his new life—his conversion, his new birth, and the changes that take place. These are not to be omitted in a book on practical Christianity. Unless they are understood in relation to practice, all that follows would be misunderstood. There are many who as professing Christians go about to make progress by natural means. But one can make no progress in the Christian life until he truly understands how bad his natural state is and just what took place when God brought him into a state of grace. The next chapters (chap. 4-8) deal with some very basic matters. They take up the attitudes a Christian should have toward progress in the Christian life—in view of the above, and in view of what God has done for him and in him if he is really a Christian. And Pink stresses something that may be startling to some believers reading this book—that even a renewed and spiritual man in Christ is unable to produce good in his life. But he doesn’t leave it there. He goes ahead to give practical recommendations on what a Christian can do about it, in spite of his inability. A number of chapters (chap. 9-12) deal with authority in Christian practice—first the authority of God (chap. 9) and His Word (chap. 10), then the authority (actually limitations) of pastors (chap. 11), and the authority of employers (chap. 12). The last requires a word of explanation. Most of the instruction in Scripture concerning relations between managers and workers falls under the master-slave relationship, and yet today, workers do not stand as slaves to their supervisors or management. Of course, most readers would have preferred that Pink discuss some of the differences as well as the similarities, which he did not do. Nevertheless, there is much that we may learn by extension from this instruction. These discussions of authority, however, are much needed today. In an era of self-assertion of independence in almost all circumstances, it is most important to understand Divine authority and the extent and limits of human authority under God. The last chapter (chap. 13) relates to enjoying God’s best for our lives. Many readers will find this the most practical of all. In spite of all that God does for us and in us, the principle still holds: "Whatsoever a man soweth, that shall he also reap" (Gal. 5:7). Pink has practical recommendations from Scripture on what a Christian can do even when he seriously fails. 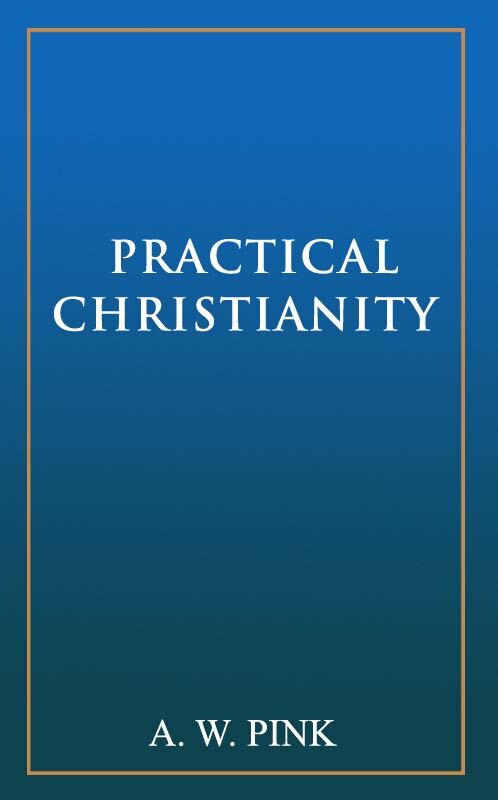 This edition of Practical Christianity keeps Pink’s work essentially as he originally wrote it. Except for a few changes in punctuation, some unusual phrases, and matters pertaining to the original monthly publication that would not be intelligible to readers today, nothing has been modified — Pink’s British spelling, most of his unusual punctuation, and his individual style are retained. These articles were first published in book form under the title Pink Jewels, a title that Pink himself most surely would not have approved. Sections which were previously omitted through oversight in that first edition have been added, and many flaws and errors have been removed.